Dead Melodies is one of the newest additions to the Cryo Chamber label. Their album Legends of the Wood, however, seems to be right at home on Cryo Chamber. This sound finds its roots in its creators post-rock influences. But very little of this actually comes out. It will be easy to find elements on Legends of the Wood that would satiate any dark ambient fan, no matter the years’ experience behind their loyalty to the genre. 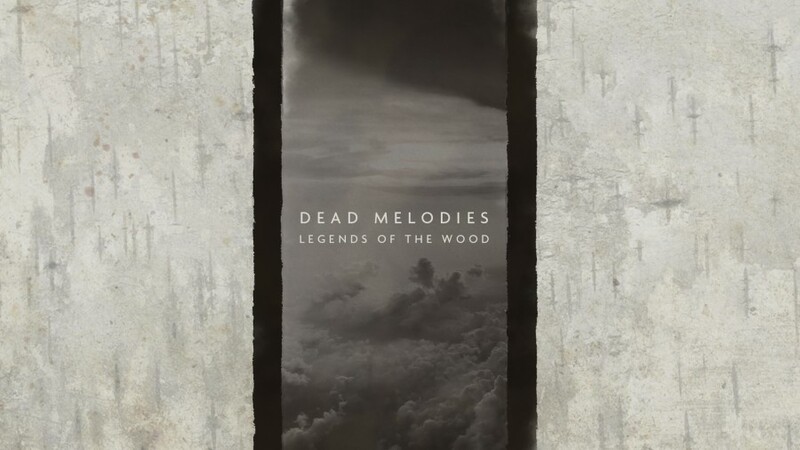 Dead Melodies have already produced two full lengths as well as some EPs over the last few years, but Legends of the Wood is likely to be the album that gets them their greatest following to date. The exquisite attention to detail, the darker theme, and the mastering work of Simon Heath (Atrium Carceri, Sabled Sun) all come together to provide us with a polished gem which gets more beautiful each time it is put on display. The impeccable composition by Tom Moore on this album can’t be understated. From the very first seconds of the opening track, “A Trial of Crows and Blood”, we hear a rich environment coming to life. The album commences with the crackling of a warm fire. This is complemented by equally warm guitar drones that fade into the mix. The combination immediately pulls the attention of the listener, takes them on a journey to this picturesque setting. The feelings induced by the opener give listeners a sense of wonder, pastoral calmness and introspection. As if we are all alone, sitting in front of the warm fire, contemplating our past and our most likely future. “On Devil’s Hill” moves the story into the outdoors. Rushing winds, birds and a plethora of other ambiance washes over the soundscape. With the move to the outdoors, so also has the album moved into darker more ominous territory. The synth drones take on a more eerie mood than their predecessors. The guitar drones lose their warmth, replacing it with the frigidness of a shadowy and uninviting land. Each track truly seems to move forward into a discerable direction. Dead Melodies may in fact be one of the best artists on Cryo Chamber at pushing their narrative forward without needing overt cues to direct the listener. Each playthrough adds another level of understanding to the whole picture. Yet, the best part about this story is its lack of rigidity. There is plenty here to contemplate, but the narrative is fluid, the listener is free to draw their own conclusions. To me, the greatest aspect on Legends of the Wood is its adherence to a dark ambient framework that seems to be growing smaller by the day. There once was a time when all this sort of music was heaped into the dark industrial bin, these days we heap it all into the dark ambient category. Meanwhile, I find distinct differences between various musicians working within these styles. One album may be 100% analog synth, giving it a much more impersonal and industrial vibe. While an album like Legends of the Wood brings a whole collection of techniques into the studio. The ambient territory on this release is brilliantly realized. At any given moment, especially on a track like “Peach Black Descent”, we are able to hear a whole world of life around us. The music easily delivers listeners to its intended realms. Much like Simon Heath’s Sabled Sun and Atrium Carceri, we are given more than just 45-60 minutes of music. We are given hours worth of material to ponder, a skeleton key to entering new realms, a looking glass into the mind of the creator. With the perfect combination of atmosphere, emotion and technical prowess, Dead Melodies gives us a lot to enjoy. Whether listening to every minute detail attempting to fully realize the back-story, or putting the album on in the background as a musical companion to work or study, Legends of the Wood proves itself to be an invaluable addition to the collection of any dark ambient listener. For me, this is one of the most interesting and refreshing albums so far in 2017. It is yet another reason to reassure their fan-base that Cryo Chamber is a dark ambient force with which to reckon.